Caesar's list for the expedition planned for the spring of 54 BC., was more detailed and had greater requirements than the first. This time he planned to win. It may have been any one, or a combination, but Caesar was determined that this time he would succeed. Caesar had established that a sneak attack using a suitable hidden harbour was not possible, as The South East part of Britain consisted of mainly slopping beaches. So a surprise assault was ruled out. In any case, the traders would have warned the Britons of the advancing army. In the face of such a formidable force, the Britons did not offer much resistance this time. The Roman forces were able to disembark without any resistance. Being of shallow draft, the ships could sail close to the beach, and left riding at anchor. Caesar marched his legions 12 miles inland in the dark of early morning to what was probably the River Stour near Canterbury. The fort Caesar refers to may well be three miles west of Canterbury in Bigbury Wood near Hambledown It is roughly rectangular. An enclosure constructed round the 200 foot contour. While such defences were adequate to repel raiding bands from nearby tribes, they were no match for the might of this Roman force. The legionaries were disciplined and trained to storm stronger defences. The 7th Legion quickly built a ramp against the side of the fort and formed a testudo by raising their shields above their heads to form a solid barrier to the missiles that most certainly were raining down upon their position. They hacked their way into the fort, driving the Britons within out into the woods. This whole battle took the best part of a day, and as his men needed rest, he built a fortified position and allowed his army to rest until the next morning. Once again the British weather worked against him. While the soldiers rested a powerful storm had severely damaged his fleet at anchor off the coast. This meant he could not advance as planned, but had to return to make necessary repairs to his vessels. His army worked night and day to drag the boats onto the beach into a fortified position they had built. They then set about the task of making repairs. This lost time and subsequent delay cost Caesar the resounding victory he had planned for. By now, he believed, he and his army would have swept across the lands, past the Thames obliterating all in their path. By now many of the tribes had formed an alliance as this was the only way they felt they would be able to battle effectively against this Roman army. Differences between the tribes had been put aside, as unity and strength in numbers was paramount. They had even appointed a supreme commander, Cassivellaunus, a chief of lands with a boundary on the north bank of the Thames. There followed a few minor battles, until Caesar sent 3 legions with cavalry support in a charge against these combined forces. By now the Britons realised that this was a more determined, and better organised expedition that the one from the previous year. The tribes retreated to the woodlands north of the Thames. In their rivers the Britons had placed underwater defences. Sharpened wooden spikes fixed at an angle to impale any swimmer who may try to cross. The Roman army had been trained for such a defence and they and the cavalry managed to cross the river with little trouble. Once across they continued pushing the Britons even further northwards. Cassivellaunus realised that his makeshift army of tribes was no match for this mighty force, so he devised an alternative plan. He withdrew his forces and kept only 4000 charioteers to harass the Roman flanks and rear. This was not intended as an attack, merely to slow the Roman advance while he moved the inhabitants from the invaders path along with the cattle. This prevented Britons being captured and used as slaves and denied the Romans food in the form of British livestock. It worked, as this resulted in a stalemate between the two forces. Then Caesar turned the battle in his favour by using one of the tribe members. A young price of the Trinovantes had gone to Gaul to seek the protection of Caesar. His father had been slain by Cassivellaunus. This meant he now had a valuable ally who held influence in the Essex area of England. He Through the prince, he persuaded the Trinovantes to not only supply food to his Roman army, but also to surrender to Rome. These tribes were Cenimagni, Segontiaci, Ancalites, Bibroci, Cassi. These people were part of tribes that bordered on Cassivellaunus ' kingdom. Apart from the Cenimagni, who were probably the Iceni, little is known of the other tribes. They informed Caesar were Cassivellaunus had placed his camps, which were duly raided by the Romans. The Britons that were not killed, fled to the woodlands. The Romans captured he cattle that were stored in these camps and so won a major victory in their campaign. 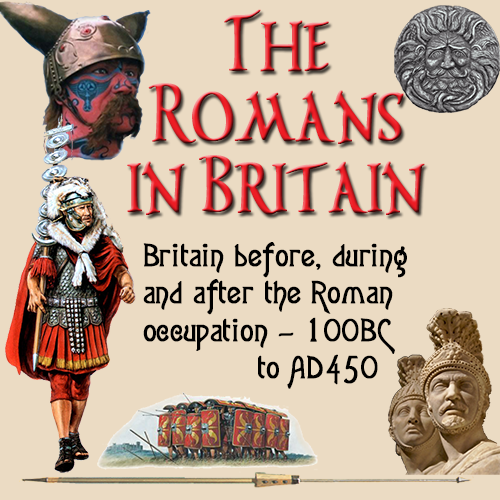 In a last desperate attempt to battle the Romans, the Kent tribes launched an assault on the Roman camp on the Kent coast in an attempt to cut the Romans connection with Europe and strand them in Britain. A battle between these tribes and the Romans ended with a retreat by the Britons. Cassivellaunus was in a total lose situation and so he approached Caesar with the intention of forging a peace between the two sides. Commius was sent to act as the negotiator. It is at this point that Caesar received news of serious trouble in Europe which meant he had to return. Before leaving Caesar took hostages, set an annual tax for the tribes to be paid to Rome and instructed Cassivellaunus not to invade the Trinovantes, who had betrayed him . The decision to leave Britain was so sudden Caesar waited a short time for ships to arrive from Gaul to ferry his troops, before using his own ships. In the autumn of 54 BC. The Romans left Britain. Although he had taken a vast area of land in Britain, it was apparent that Caesar had not taken the time to examine his enemy before the expedition. In this case, it was not only the British people he had underestimated, but also the sea.